The Burlingame Rodeo Days Cutest Baby Contest revealed the cutest cowboys and cowgirls in Osage County. 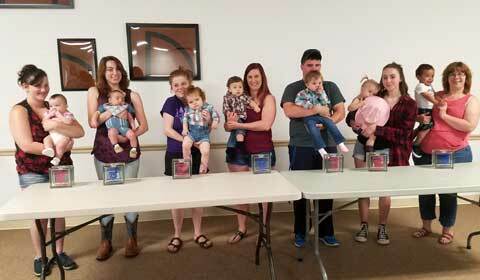 Winners were announced as, from left, first girls 0-6 months, Kisara Horn; first boys 0-6 months, Garret Smith; first girls 7-12 months, Addison Castro; first boys 7-12 months, Malik Walker; first girls 13-18 months, Kinsley Welch; first girls 19-24 months, Kenzie Sedan; first boys 19-24 months, Caden Walquist. Malik Walker was named as the Overall Cutest Cowboy. The Burlingame Rodeo Days baby contest was held May 19, 2018. Information thanks to Marcie Quaney.